The Fig. 1 shows a radial distribution system. When the distributor is connected to substation on one end only with the help of feeder, then the system is called radial distribution system. The feeders, distributors and service mains are radiating away from the substation hence name given as radial system. 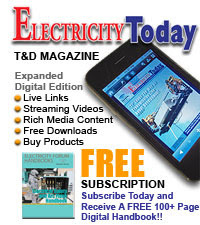 There are combinations of one distributor and one feeder, connecting that distributor to the substation. In Fig. 1, distributor 1 is connected only at one end to substation through a feeder at point A. Similarly the other feeder is feeding the distributor 2, only at one point B. Due to such system, if the fault occurs either on feeder or a distributor, all the consumers connected to that distributor will get affected. There would be an interruption of supply to all such consumers. Similarly the end of the distributor nearer to the substation will get heavily loaded than the end which is too far away from the substation. Similarly the consumers at the distant end of the distributor would be subjected to the voltage variations and fluctuations, as the load on the distributor changes. The system is advantageous only when the generation is at low voltage level and the substation is loaded at the center of the load. 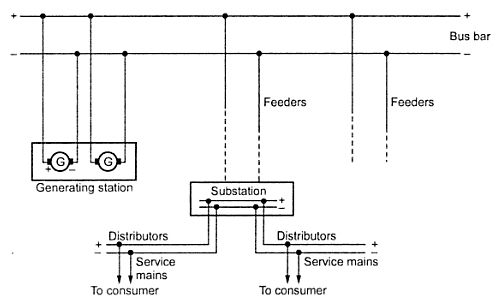 The fault on a feeder or a distributor causes interruption in supply to all the consumers connected to the distributor. This can be avoided by modifying the radial system as shown in the Fig. 2. In this system, the distributor is fed at number of points with the help of feeders. In Fig. 2, the feeders from the substation are feeding to a single distributor at points A, B and C.
1. Simplest as fed at only end. 2. The initial cost is low. 3. 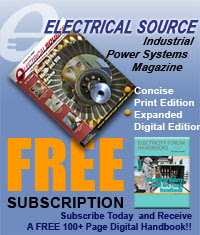 Useful when the generating is at low voltage. 4. Preferred when the station is located at the centre of the load. Apart from its advantages, this system is suffered from the following disadvantages. 1. The end of distributor near to the substation gets heavily loaded. 2. When load on the distributor changes, the consumers at the distant end of the distributor face serious voltage fluctuations. 3. As consumers are dependent on single feeder and distributor, a fault on any of these two causes interruption in supply to all the consumers connected to that distributor.